After a few heat cycles on the pump, recheck the eight (8) socket head cap screws attaching the pump center section to the body for tightness. Re-tighten if necessary. If the bolts continue to loosen after one re-tightening, remove the screws one at a time and apply a small amount of Loctite® “Blue” retaining compound. 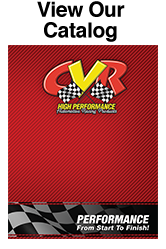 When considering purchasing the Ford water pump, you will notice that CVR offers the “back plate” separately. Many of today’s race cars use a full front motor plate or a belt drive system for the cam. In the Ford engine, the front motor plate or the cam belt drive may also be used to block off the center chamber in the timing cover housing and drilled only in the one spot on each side to allow water flow back into the engine block. In this case, the back plate is an unnecessary piece and may not be needed. In all other cases a back plate will be necessary.